For example, companies could sell certain products only to consumers who have a certain minimum or maximum score on one or more of the certain Central Six [personality] traits…. Lexus could sell the “Mensa Quartz Medallic” color of the LS 460 only to customers whose validated intelligence scores are high enough for them to join Mensa International (IQ 130+ or the top one in fifty). The more exclusive “Prometheus Glacier Pearl” color could indicate an IQ above 160 (the top one in thirty thousand) — the qualification for joining the Prometheus Society. Too late! This idea is clearly stolen from J.T. 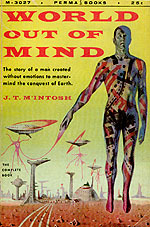 M’Intosh’s World Out of Mind, putatively a novel about an alien invasion of Earth, but in reality just a vehicle that allows him to lovingly describe a future in which everyone takes a cognitive test in early adulthood and is assigned a color forevermore. There are the dull witted Browns, the worker bee Purples, the middling bright Reds, all the way through the Oranges, Yellows, and supergenius Whites. And in case that’s not enough for you, each color is further divided into its Circles at the bottom, followed by its Triangles and then its Stars. The White Stars, needless to say, run the world. And in M’Intosh’s world, you wear your badge at all times or else. 50s science fiction. You can’t beat it. We will now return to our normal political kvetching.